In astrophysics, accretion is the accumulation of particles into a massive object by gravitationally attracting more matter, typically gaseous matter, in an accretion disk. Most astronomical objects, such as galaxies, stars, and planets, are formed by accretion processes. The accretion model that Earth and the other terrestrial planets formed from meteoric material was proposed in 1944 by Otto Schmidt, followed by the protoplanet theory of William McCrea (1960) and finally the capture theory of Michael Woolfson. In 1978, Andrew Prentice resurrected the initial Laplacian ideas about planet formation and developed the modern Laplacian theory. None of these models proved completely successful, and many of the proposed theories were descriptive. The 1944 accretion model by Otto Schmidt was further developed in a quantitative way in 1969 by Viktor Safronov. He calculated, in detail, the different stages of terrestrial planet formation. Since then, the model has been further developed using intensive numerical simulations to study planetesimal accumulation. It is now accepted that stars form by the gravitational collapse of interstellar gas. Prior to collapse, this gas is mostly in the form of molecular clouds, such as the Orion Nebula. As the cloud collapses, losing potential energy, it heats up, gaining kinetic energy, and the conservation of angular momentum ensures that the cloud forms a flatted disk—the accretion disk. A few hundred thousand years after the Big Bang, the Universe cooled to the point where atoms could form. As the Universe continued to expand and cool, the atoms lost enough kinetic energy, and dark matter coalesced sufficiently, to form protogalaxies. As further accretion occurred, galaxies formed. Indirect evidence is widespread. Galaxies grow through mergers and smooth gas accretion. Accretion also occurs inside galaxies, forming stars. Stars are thought to form inside giant clouds of cold molecular hydrogen—giant molecular clouds of roughly 300,000 M☉ and 65 light-years (20 pc) in diameter. Over millions of years, giant molecular clouds are prone to collapse and fragmentation. These fragments then form small, dense cores, which in turn collapse into stars. The cores range in mass from a fraction to several times that of the Sun and are called protostellar (protosolar) nebulae. They possess diameters of 2,000–20,000 astronomical units (0.01–0.1 pc) and a particle number density of roughly 10,000 to 100,000/cm3 (160,000 to 1,600,000/cu in). Compare it with the particle number density of the air at the sea level—2.8×1019/cm3 (4.6×1020/cu in). As the infall of material from the disk continues, the envelope eventually becomes thin and transparent and the young stellar object (YSO) becomes observable, initially in far-infrared light and later in the visible. Around this time the protostar begins to fuse deuterium. If the protostar is sufficiently massive (above 80 MJ), hydrogen fusion follows. Otherwise, if its mass is too low, the object becomes a brown dwarf. This birth of a new star occurs approximately 100,000 years after the collapse begins. Objects at this stage are known as Class I protostars, which are also called young T Tauri stars, evolved protostars, or young stellar objects. By this time, the forming star has already accreted much of its mass; the total mass of the disk and remaining envelope does not exceed 10–20% of the mass of the central YSO. At the next stage, the envelope completely disappears, having been gathered up by the disk, and the protostar becomes a classical T Tauri star. The latter have accretion disks and continue to accrete hot gas, which manifests itself by strong emission lines in their spectrum. The former do not possess accretion disks. Classical T Tauri stars evolve into weakly lined T Tauri stars. This happens after about 1 million years. The mass of the disk around a classical T Tauri star is about 1–3% of the stellar mass, and it is accreted at a rate of 10−7 to 10−9 M☉ per year. A pair of bipolar jets is usually present as well. The accretion explains all peculiar properties of classical T Tauri stars: strong flux in the emission lines (up to 100% of the intrinsic luminosity of the star), magnetic activity, photometric variability and jets. The emission lines actually form as the accreted gas hits the "surface" of the star, which happens around its magnetic poles. The jets are byproducts of accretion: they carry away excessive angular momentum. The classical T Tauri stage lasts about 10 million years. The disk eventually disappears due to accretion onto the central star, planet formation, ejection by jets, and photoevaporation by ultraviolet radiation from the central star and nearby stars. As a result, the young star becomes a weakly lined T Tauri star, which, over hundreds of millions of years, evolves into an ordinary Sun-like star, dependent on its initial mass. Self-accretion of cosmic dust accelerates the growth of the particles into boulder-sized planetesimals. The more massive planetesimals accrete some smaller ones, while others shatter in collisions. Accretion disks are common around smaller stars, or stellar remnants in a close binary, or black holes surrounded by material, such as those at the centers of galaxies. Some dynamics in the disk, such as dynamical friction, are necessary to allow orbiting gas to lose angular momentum and fall onto the central massive object. Occasionally, this can result in stellar surface fusion (see Bondi accretion). In the formation of terrestrial planets or planetary cores, several stages can be considered. First, when gas and dust grains collide, they agglomerate by microphysical processes like van der Waals forces and electromagnetic forces, forming micrometer-sized particles; during this stage, accumulation mechanisms are largely non-gravitational in nature. However, planetesimal formation in the centimeter-to-meter range is not well understood, and no convincing explanation is offered as to why such grains would accumulate rather than simply rebound. :341 In particular, it is still not clear how these objects grow to become 0.1–1 km (0.06–0.6 mi) sized planetesimals; this problem is known as the "meter size barrier": As dust particles grow by coagulation, they acquire increasingly large relative velocities with respect to other particles in their vicinity, as well as a systematic inward drift velocity, that leads to destructive collisions, and thereby limit the growth of the aggregates to some maximum size. Ward (1996) suggests that when slow moving grains collide, the very low, yet non-zero, gravity of colliding grains impedes their escape. :341 It is also thought that grain fragmentation plays an important role replenishing small grains and keeping the disk thick, but also in maintaining a relatively high abundance of solids of all sizes. A number of mechanisms have been proposed for crossing the 'meter-sized' barrier. Local concentrations of pebbles may form, which then gravitationally collapse into planetesimals the size of large asteroids. These concentrations can occur passively due to the structure of the gas disk, for example, between eddies, at pressure bumps, at the edge of a gap created by a giant planet, or at the boundaries of turbulent regions of the disk. Or, the particles may take an active role in their concentration via a feedback mechanism referred to as a streaming instability. In a streaming instability the interaction between the solids and the gas in the protoplanetary disk results in the growth of local concentrations, as new particles accumulate in the wake of small concentrations, causing them to grow into massive filaments. Alternatively, if the grains that form due to the agglomeration of dust are highly porous their growth may continue until they become large enough to collapse due to their own gravity. The low density of these objects allows them to remain strongly coupled with the gas, thereby avoiding high velocity collisions which could result in their erosion or fragmentation. Grains eventually stick together to form mountain-size (or larger) bodies called planetesimals. Collisions and gravitational interactions between planetesimals combine to produce Moon-size planetary embryos (protoplanets) over roughly 0.1–1 million years. Finally, the planetary embryos collide to form planets over 10–100 million years. The planetesimals are massive enough that mutual gravitational interactions are significant enough to be taken into account when computing their evolution. Growth is aided by orbital decay of smaller bodies due to gas drag, which prevents them from being stranded between orbits of the embryos. Further collisions and accumulation lead to terrestrial planets or the core of giant planets. If the planetesimals formed via the gravitational collapse of local concentrations of pebbles their growth into planetary embryos and the cores of giant planets is dominated by the further accretions of pebbles. Pebble accretion is aided by the gas drag felt by objects as they accelerate toward a massive body. Gas drag slows the pebbles below the escape velocity of the massive body causing them to spiral toward and to be accreted by it. Pebble accretion may accelerate the formation of planets by a factor of 1000 compared to the accretion of planetesimals, allowing giant planets to form before the dissipation of the gas disk. Yet, core growth via pebble accretion appears incompatible with the final masses and compositions of Uranus and Neptune. The formation of terrestrial planets differs from that of giant gas planets, also called Jovian planets. The particles that make up the terrestrial planets are made from metal and rock that condense in the inner Solar System. However, Jovian planets begin as large, icy planetesimals, which then capture hydrogen and helium gas from the solar nebula. Differentiation between these two classes of planetesimals arise due to the frost line of the solar nebula. Meteorites contain a record of accretion and impacts during all stages of asteroid origin and evolution; however, the mechanism of asteroid accretion and growth is not well understood. Evidence suggests the main growth of asteroids can result from gas-assisted accretion of chondrules, which are millimeter-sized spherules that form as molten (or partially molten) droplets in space before being accreted to their parent asteroids. 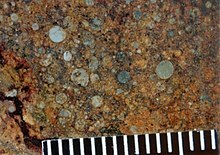 In the inner Solar System, chondrules appear to have been crucial for initiating accretion. The tiny mass of asteroids may be partly due to inefficient chondrule formation beyond 2 AU, or less-efficient delivery of chondrules from near the protostar. Also, impacts controlled the formation and destruction of asteroids, and are thought to be a major factor in their geological evolution. Chondrules, metal grains, and other components likely formed in the solar nebula. These accreted together to form parent asteroids. Some of these bodies subsequently melted, forming metallic cores and olivine-rich mantles; others were aqueously altered. After the asteroids had cooled, they were eroded by impacts for 4.5 billion years, or disrupted. For accretion to occur, impact velocities must be less than about twice the escape velocity, which is about 140 m/s (460 ft/s) for a 100 km (60 mi) radius asteroid. Simple models for accretion in the asteroid belt generally assume micrometer-sized dust grains sticking together and settling to the midplane of the nebula to form a dense layer of dust, which, because of gravitational forces, was converted into a disk of kilometer-sized planetesimals. But, several arguments[which?] suggest that asteroids may not have accreted this way. The geology of 2014 MU69. Notable surface features are highlighted. Comets, or their precursors, formed in the outer Solar System, possibly millions of years before planet formation. How and when comets formed is debated, with distinct implications for Solar System formation, dynamics, and geology. Three-dimensional computer simulations indicate the major structural features observed on cometary nuclei can be explained by pairwise low velocity accretion of weak cometesimals. The currently favored formation mechanism is that of the nebular hypothesis, which states that comets are probably a remnant of the original planetesimal "building blocks" from which the planets grew. Astronomers think that comets originate in both the Oort cloud and the scattered disk. The scattered disk was created when Neptune migrated outward into the proto-Kuiper belt, which at the time was much closer to the Sun, and left in its wake a population of dynamically stable objects that could never be affected by its orbit (the Kuiper belt proper), and a population whose perihelia are close enough that Neptune can still disturb them as it travels around the Sun (the scattered disk). Because the scattered disk is dynamically active and the Kuiper belt relatively dynamically stable, the scattered disk is now seen as the most likely point of origin for periodic comets. The classic Oort cloud theory states that the Oort cloud, a sphere measuring about 50,000 AU (0.24 pc) in radius, formed at the same time as the solar nebula and occasionally releases comets into the inner Solar System as a giant planet or star passes nearby and causes gravitational disruptions. Examples of such comet clouds may already have been seen in the Helix Nebula. The Rosetta mission to comet 67P/Churyumov–Gerasimenko determined in 2015 that when Sun's heat penetrates the surface, it triggers evaporation (sublimation) of buried ice. While some of the resulting water vapour may escape from the nucleus, 80% of it recondenses in layers beneath the surface. This observation implies that the thin ice-rich layers exposed close to the surface may be a consequence of cometary activity and evolution, and that global layering does not necessarily occur early in the comet's formation history. While most scientists thought that all the evidence indicated that the structure of nuclei of comets is processed rubble piles of smaller ice planetesimals of a previous generation, the Rosetta mission dispelled the idea that comets are "rubble piles" of disparate material. ^ "Science with the VLTI". European Southern Observatory. 8 August 2008. Archived from the original on 24 May 2011. Retrieved 11 April 2011. ^ Masters, Harris (26 August 2010). "Transcript of The Accretion of Galaxies and Stars". Prezi. Retrieved 8 January 2016. ^ a b Woolfson, M. M. (March 1993). "The Solar System—its Origin and Evolution". Quarterly Journal of the Royal Astronomical Society. 34: 1–20. Bibcode:1993QJRAS..34....1W. For details of Kant's position, see Palmquist, Stephen (September 1987). "Kant's Cosmogony Re-evaluated". Studies in History and Philosophy of Science. 18 (3): 255–269. Bibcode:1987SHPS...18..255P. ^ Henbest, Nigel (24 August 1991). "Birth of the planets: The Earth and its fellow planets may be survivors from a time when planets ricocheted around the Sun like ball bearings on a pinball table". New Scientist. Retrieved 18 April 2008. ^ a b c Papaloizou, John C. B.; Terquem, Caroline (28 November 2005). "Planet formation and migration" (PDF). CERN. Retrieved 21 October 2015. ^ Safronov, Viktor S. (1972) . Evolution of the Protoplanetary Cloud and Formation of the Earth and the Planets. Jerusalem: Israel Program for Scientific Translations. ISBN 0-7065-1225-1. NASA Technical Translation F-677. ^ a b Kereš, Dušan; Davé, Romeel; Fardal, Mark; Faucher-Giguere, C.-A. ; Hernquist, Lars; et al. (2010). Gas Accretion in Galaxies (PDF). Massive Galaxies Over Cosmic Time 3. 8–10 November 2010. Tucson, Arizona. National Optical Astronomy Observatory. ^ a b c d e f g Montmerle, Thierry; Augereau, Jean-Charles; Chaussidon, Marc; Counelle, Mathieu; Marty, Bernard; et al. (June 2006). "Solar System Formation and Early Evolution: the First 100 Million Years". Earth, Moon, and Planets. 98 (1–4): 39–95. Bibcode:2006EM&P...98...39M. doi:10.1007/s11038-006-9087-5. ^ a b c d Pudritz, Ralph E. (January 2002). "Clustered Star Formation and the Origin of Stellar Masses". Science. 295 (5552): 68–75. Bibcode:2002Sci...295...68P. doi:10.1126/science.1068298. PMID 11778037. ^ Clark, Paul C.; Bonnell, Ian A. (July 2005). "The onset of collapse in turbulently supported molecular clouds". Monthly Notices of the Royal Astronomical Society. 361 (1): 2–16. Bibcode:2005MNRAS.361....2C. doi:10.1111/j.1365-2966.2005.09105.x. ^ a b c Motte, F.; Andre, P.; Neri, R. (August 1998). "The initial conditions of star formation in the ρ Ophiuchi main cloud: wide-field millimeter continuum mapping". Astronomy and Astrophysics. 336: 150–172. Bibcode:1998A&A...336..150M. ^ Stahler, Steven W. (September 1988). "Deuterium and the Stellar Birthline". The Astrophysical Journal. 332: 804–825. Bibcode:1988ApJ...332..804S. doi:10.1086/166694. ^ Mohanty, Subhanjoy; Jayawardhana, Ray; Basri, Gibor (June 2005). "The T Tauri Phase down to Nearly Planetary Masses: Echelle Spectra of 82 Very Low Mass Stars and Brown Dwarfs". The Astrophysical Journal. 626 (1): 498–522. arXiv:astro-ph/0502155. Bibcode:2005ApJ...626..498M. doi:10.1086/429794. ^ Martin, E. L.; Rebolo, R.; Magazzu, A.; Pavlenko, Ya. V. (February 1994). "Pre-main sequence lithium burning". Astronomy and Astrophysics. 282: 503–517. arXiv:astro-ph/9308047. Bibcode:1994A&A...282..503M. ^ Hartmann, Lee; Calvet, Nuria; Gullbring, Eric; D'Alessio, Paula (March 1998). "Accretion and the evolution of T Tauri disks". The Astrophysical Journal. 495 (1): 385–400. Bibcode:1998ApJ...495..385H. doi:10.1086/305277. ^ a b Muzerolle, James; Calvet, Nuria; Hartmann, Lee (April 2001). "Emission-line diagnostics of T Tauri magnetospheric accretion. II. Improved model tests and insights into accretion physics". The Astrophysical Journal. 550 (2): 944–961. Bibcode:2001ApJ...550..944M. doi:10.1086/319779. ^ Adams, Fred C.; Hollenbach, David; Laughlin, Gregory; Gorti, Uma (August 2004). "Photoevaporation of circumstellar disks due to external far-ultraviolet radiation in stellar aggregates". The Astrophysical Journal. 611 (1): 360–379. arXiv:astro-ph/0404383. Bibcode:2004ApJ...611..360A. doi:10.1086/421989. ^ a b c Ward, William R. (1996). "Planetary Accretion". ASP Conference Series. Completing the Inventory of the Solar System. 107: 337–361. Bibcode:1996ASPC..107..337W. ^ a b Chambers, John E. (July 2004). "Planetary accretion in the inner Solar System". Earth and Planetary Science Letters. 233 (3–4): 241–252. Bibcode:2004E&PSL.223..241C. doi:10.1016/j.epsl.2004.04.031. ^ Küffmeier, Michael (3 April 2015). "What is the meter size barrier?". Astrobites. Retrieved 15 January 2015. ^ a b Birnstiel, T.; Dullemond, C. P.; Brauer, F. (August 2009). "Dust retention in protoplanetary disks". Astronomy and Astrophysics. 503 (1): L5–L8. arXiv:0907.0985. Bibcode:2009A&A...503L...5B. doi:10.1051/0004-6361/200912452. ^ a b Johansen, A.; Blum, J.; Tanaka, H.; Ormel, C.; Bizzarro, M.; Rickman, H. (2014). "The Multifaceted Planetesimal Formation Process". In Beuther, H.; Klessen, R. S.; Dullemond, C. P.; Henning, T. Protostars and Planets VI. University of Arizona Press. pp. 547–570. arXiv:1402.1344. Bibcode:2014prpl.conf..547J. doi:10.2458/azu_uapress_9780816531240-ch024. ISBN 978-0-8165-3124-0. ^ Weidenschilling, S. J.; Spaute, D.; Davis, D. R.; Marzari, F.; Ohtsuki, K. (August 1997). "Accretional Evolution of a Planetesimal Swarm". Icarus. 128 (2): 429–455. Bibcode:1997Icar..128..429W. doi:10.1006/icar.1997.5747. ^ Kary, David M.; Lissauer, Jack; Greenzweig, Yuval (November 1993). "Nebular Gas Drag and Planetary Accretion". Icarus. 106: 288–307. Bibcode:1993Icar..106..288K. doi:10.1006/icar.1993.1172. ^ Lewin, Sarah (19 August 2015). "To Build a Gas Giant Planet, Just Add Pebbles". Space.com. Retrieved 22 November 2015. ^ Helled, Ravit; Bodenheimer, Peter (July 2014). "The Formation of Uranus and Neptune: Challenges and Implications for Intermediate-mass Exoplanets". The Astrophysical Journal. 789 (1). 69. arXiv:1404.5018. Bibcode:2014ApJ...789...69H. doi:10.1088/0004-637X/789/1/69. ^ D'Angelo, Gennaro; Durisen, Richard H.; Lissauer, Jack J. (December 2010). "Giant Planet Formation". In Seager, Sara. Exoplanets. University of Arizona Press. pp. 319–346. arXiv:1006.5486. Bibcode:2010exop.book..319D. ISBN 978-0-8165-2945-2. ^ Bennett, Jeffrey; Donahue, Megan; Schneider, Nicholas; Voit, Mark (2014). "Formation of the Solar System". The Cosmic Perspective (7th ed.). San Francisco: Pearson. pp. 136–169. ISBN 978-0-321-89384-0. ^ a b Johansen, Anders (April 2015). "Growth of asteroids, planetary embryos, and Kuiper belt objects by chondrule accretion". Science Advances. 1 (3): e1500109. arXiv:1503.07347. Bibcode:2015SciA....1E0109J. doi:10.1126/sciadv.1500109. ^ a b c d e f Scott, Edward R. D. (2002). "Meteorite Evidence for the Accretion and Collisional Evolution of Asteroids" (PDF). In Bottke Jr., W. F.; Cellino, A.; Paolicchi, P.; Binzel, R. P. Asteroids III. University of Arizona Press. pp. 697–709. Bibcode:2002aste.book..697S. ISBN 978-0-8165-2281-1. ^ Shukolyukov, A.; Lugmair, G. W. (2002). "Chronology of Asteroid Accretion and Differentiation" (PDF). In Bottke Jr., W. F.; Cellino, A.; Paolicchi, P.; Binzel, R. P. Asteroids III. pp. 687–695. Bibcode:2002aste.book..687S. ISBN 978-0-8165-2281-1. ^ Bartels, Meghan (18 March 2019). "NASA's New Horizons Reveals Geologic 'Frankenstein' That Formed Ultima Thule". Space.com. Retrieved 18 March 2019. ^ Chang, Kenneth (18 March 2019). "How Ultima Thule Is Like a Sticky, Pull-Apart Pastry". The New York Times. Retrieved 19 March 2019. ^ a b Levison, Harold F.; Donnes, Luke (2007). "Comet Populations and Cometary Dynamics". In McFadden, Lucy-Ann Adams; Weissman, Paul Robert; Johnson, Torrence V. Encyclopedia of the Solar System (2nd ed.). Amsterdam: Academic Press. pp. 575–588. ISBN 0-12-088589-1. ^ Greenberg, Richard (1985). "The Origin of Comets among the Accreting Outer Planets". In Carusi, Andrea; Valsecchi, Giovanni B. Dynamics of Comets: Their Origin and Evolution. Astrophysics and Space Science Library, Volume 115. Springer Netherlands. pp. 3–10. Bibcode:1985ASSL..115....3G. doi:10.1007/978-94-009-5400-7_1. ^ "Evaporation and Accretion of Extrasolar Comets Following White Dwarf Kicks". Cornell University Department of Astronomy. 2014. Retrieved 22 January 2016.